We love our new building! This is an outstanding, if not brilliant, example of period mood music. Note in the copy below that Phineas improvised his work on this LP. 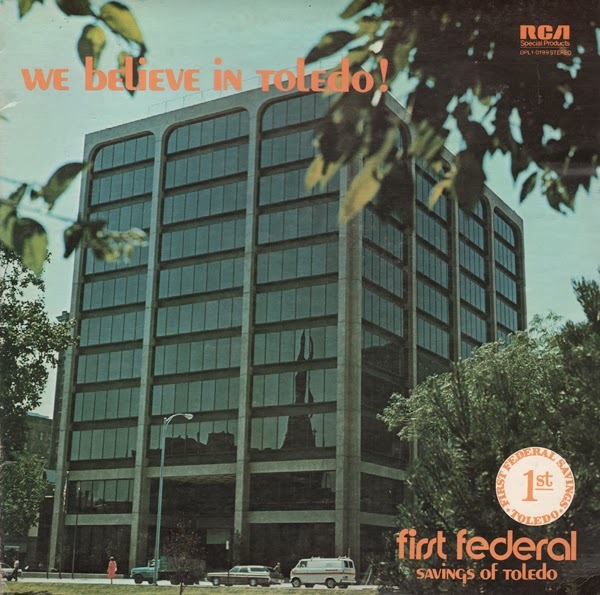 Farnon offers the orchestrated foundation, that seems to pull Phineas and his "jazz riffs", time and time again back to the "theme" of the record. The two creatives never seem to fight for attention, the blend seems perfect. 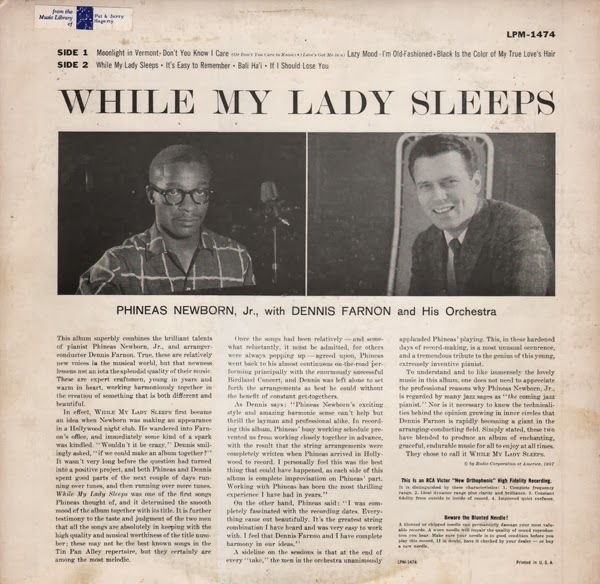 From the back cover: As Dennis says: Phineas Newborn's exciting style and amazing harmonic sense can't help but thrill the layman and professional alike. 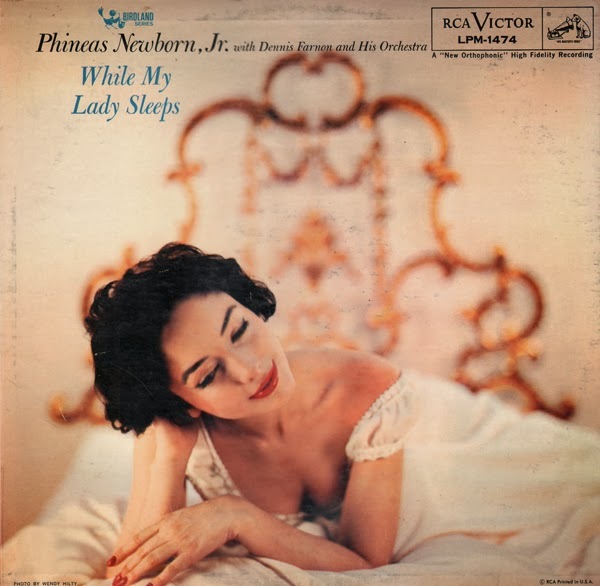 In recording this album, Phineas busy working schedule prevented us from working closely together in advance, with the result that the string arrangements were completely written when Phineas arrived in Hollywood to record. I personally feel this was the best thing that could have happened, as each side of this album is complete improvisation on Phineas' part. Working with Phineas has been the most thrilling experience I have had in years. Obscure Italian press compilation album. Selected sophisticated 70s flavored soundtrack samples. From the back cover: Percussionists in general, and Jack Costanzo in particular, have become very attached to the music of Cole Porter. His melodies contain wonderfully varied and interesting rhythm patterns which lend themselves to a creative interpretation by the drummer. 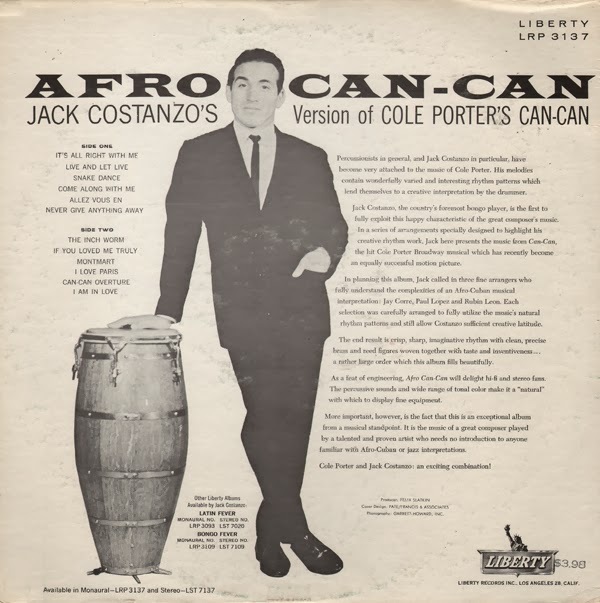 In planning this album, Jack called in three fine arrangers who fully understand the complexities of a Afro-Cuban musical interoperation: Jay Corre, Paul Lopez and Rubin Leon. 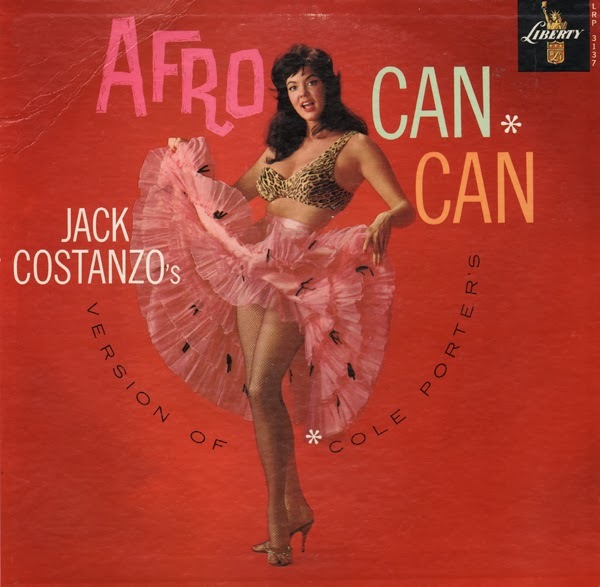 As a feat of engineering, Afro Can-Can will delight hi-fi and stereo fans. The percussive sounds and wide range of tonal color make it a "natural" with which to display fine equipment. I don't why I'm drawn to Acquaviva albums. 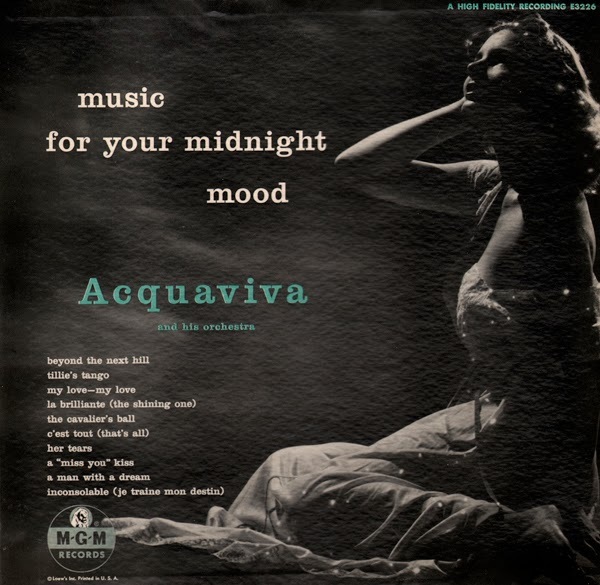 Acquaviva… That's a cool name and the cover artwork is cool. The engineering is excellent and the sound, lush - but the music in my opinion, is bit heavy for a "midnight mood". From the back cover: What about this Acquaviva? Well, to clear up an often-questioned mystery right at the outset, he does have a first name. It's Anthony, but he prefers to respond to "Tony". Although he's a young man – in his late twenties at the time these recordings were made – he's already proven himself to be one of the most individualistic and thoughtful conductor-arranger-composers on the current American musical scene. Bad budget pressing… suggestive title… out of focus cheesecake art and organ music that doesn't party. I loved it! The date comes from a penned notation found on the back cover. Also from the back cover: Canticle No. 3 was first heard in San Francisco in 1941. 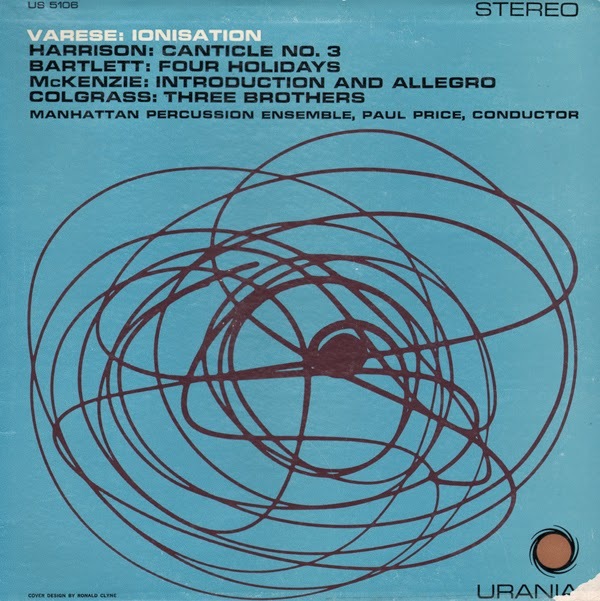 Its composer, Lou Harrison (born in 1917), a student of Arnold Schoenberg, Henry Cowell, and Howard Cooper, has been an outstanding contributor to percussion music repertory. The work is made up of two folk melodies, each stated in turn by the ocarina and cleverly imitated by the melodic implications of the non-definite percussion. A constant measure signature (4/4) and tempo offers the challenging use of abnormal (long) groupings to achieve augmentation, development, and the unusual musical contrasts. Among the unusual instruments unitized by the seven players are ocarina, six iron pipes, five brake drums (muted), size water buffalo bells, two sistra, etc. The individual responsible for bringing together the men and the music on this disc is Paul Price. 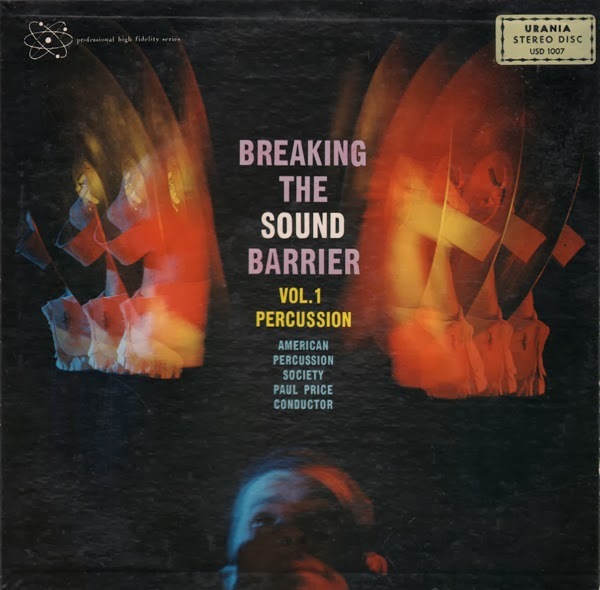 It is important to point out that he has been directly responsible for pioneering efforts with percussion players which led to a renewed interest in serious percussion music and composition for percussion ensembles. Leopold Stolowski in 1953 dubbed him "Mr. Percussion". A graduate of the New England and Cincinnati Conservatories of Music, Mr. Price has organized percussion groups, given concerts, written articles and textbooks, appeared often as percussion recitalist and lecturer. He was responsible for organizing the first school-accredited percussion ensemble class in 1950. At present a teacher of timpani and percussion at Boston University's School of Music and conductor of its percussion ensemble, Mr. Price is rewarded by Seeming his students (among whom are Jack McKenzie and Michael Colgrass) share his enthusiasm and make names for themselves as performers and composers of percussion works. The Urania "Stereo Disc" label in the upper right hand corner of the jacket cover is a sticker. It is possible that Urania used overrun mono covers to package this stereo release. This is a reissue of Breaking The Sound Barrier - Vol. 1 Percussion. For her part, Miss McCall is at her best in the jazz idiom with a hard-hitting jazz background since her attack is largely that of an instrumental and always in superb taste. Miss McCall, also a native of Philadelphia, worked with the Ventura group in the mid-1950s after stints with the Tommy Dorsey and Woody Herman bands. On "Careless," " Please Be Kind." and "Detour Ahead." the personnel includes: Bob Carter, bass; Sonny Igoe, drums; Dave McKenna, piano, and Ventura, saxophone. 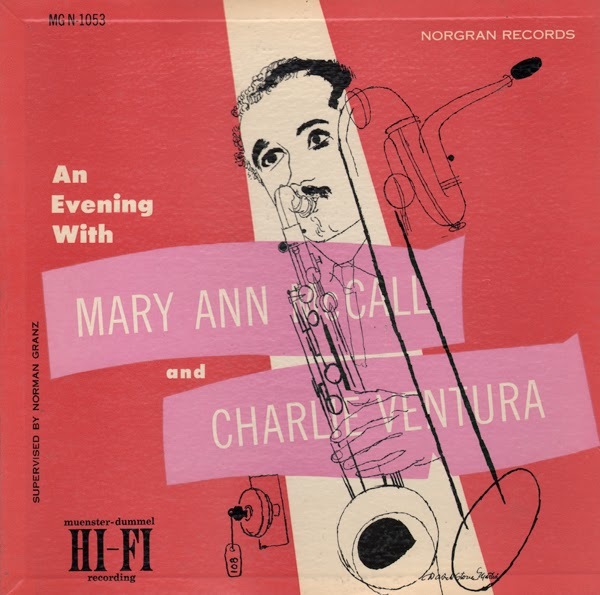 Personnel on the other sides are: Leonard Hambro, alto saxophone; Daniel Bank, baritone saxophone; Charlie Shavers, trumpet; Kai Winding, trombone; Dave McKenna, piano; Perry Lopez, guitar; Bob Carter, bass; Sonny Igoe, drums, and Ventura, tenor saxophone. 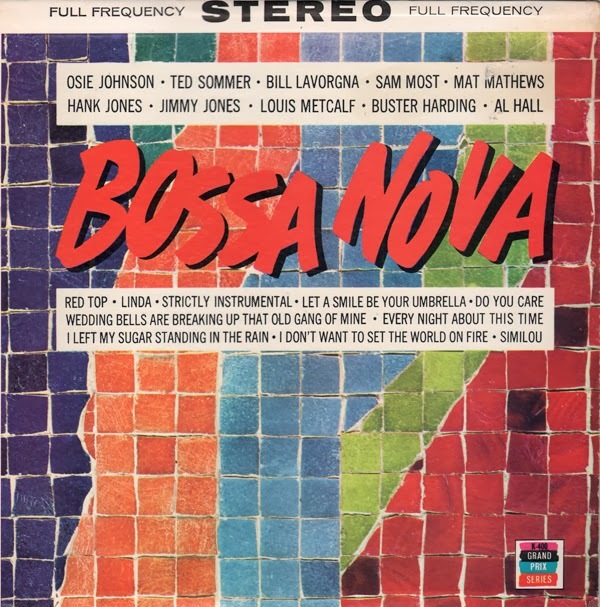 You'll find a jazzy Bossa Nova set on this budget label LP. There is no indication of who the session musicians were. The set sounds like a mix of several combos.